With tender hands of compassion and genuine hearts of love, S. Jones F. and C. joins with the devoted loved ones of Mother Geraldine B. Moore, 85, of Enfield, as they prepare to say “Until We Meet Again." 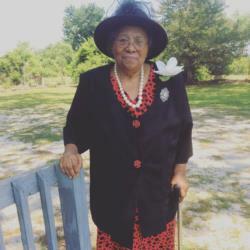 Mother Moore, the wife of the late Bishop Samuel Moore, was greeted by her loving Savior Jesus Christ along with others in the Heavenly Host on Thursday, January 31, 2019 as she quietly answered the masters call. The family will be present to greet family and friends during a visitation that is to be held 6 pm - 7 pm, Friday, February 08, 2019, in the chapel of S. Jones Funerals and Cremations. A Service of Triumph to Celebrate Her Life and Legacy will be held 12 pm, Saturday, February 09, 2019, in the sanctuary of the St. Paul Baptist Church 421 S. McDaniel St., Enfield, NC 27823. Her mortal frame will be laid to rest in the Elmwood Cemetery. To the Moore family:I'm so very sorry for your lose.Keep your hand in Jesus hand ,he will see you thru.She was a nice lady and will truly be missed. Mrs. Moore, I will TRULY MISS you. YOU were a GREAT neighbor and TRUE friend to me. SIP UNTIL we meet AGAIN. ?? We were sadden to hear of mother Moore home going, Ms. Geraldine and mom shared so many fun times, keeping each other company, sharing the good times and the not so good, they looked out for not only themselves but so many others in the community and surrounding areas., may God comfort the family knowing that she fought a good fight and kept the Faith until her Master called from labor to reward!!! May care and love of those around you provide comfort and peace to get you through the days ahead. My most sincere condolences to you and your family. SENDING OUR DEEPEST CONDOLENCES FROM THE WILKINS FAMILY. What a joyous service to honor the life of one of God's earthly angels, our neighbor and mother in Christ. Prayers for the Moore family for truly this heavenly gain hurts. Her works of sharing and giving spoke for her. Rest in Paradise, Mrs. Moore.